If you’re wondering how difficult it is to make cheese souffle, it may be easier than you think! Our cheese souffle recipe is excellent for lots of occasions. Cook it as a weeknight dinner or weekend breakfast that’s sure to surprise and delight your family. Your kids probably don’t have many friends whose parents can claim they’ve made a souffle for a family meal. This recipe’s four servings make it the perfect size to feed your family. 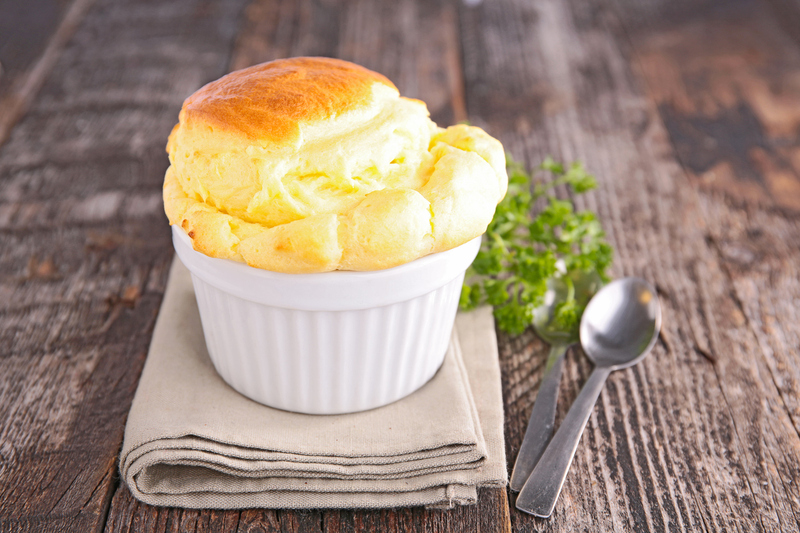 If you’re ready to try your hand at homemade cheese souffle, check out our recipe below! Position a rack in your oven to the bottom third of the oven. Preheat the oven to 400 degrees. Grease a 6-cup souffle dish. Add the parmesan cheese, moving the dish around to coat the cheese evenly across the bottom and sides of the dish. Simmer the milk in a saucepan over low heat, about six minutes. While the milk is simmering, melt the butter in a large saucepan. Add the flour and whisk the mixture continuously, about four minutes. The mixture should not brown. If you need to, reduce the heat to keep it from browning. Once you’re done whisking, remove the saucepan from the heat and let it sit for about two minutes. Add the milk to the butter and flour mixture. Whisk the mixture until there aren’t any lumps. Put the mixture back over medium heat. Cook the mixture for about three minutes, whisking it continuously. Once it becomes very thick, remove it from the heat. Add the paprika, garlic powder, dried mustard, and salt. Whisk the mixture until the spices are well-combined. Whisk in the egg yolks one at a time. Transfer the mixture to a large bowl. Use a rubber spatula to scrape all of it out. Let it sit until it becomes room temperature. While the mixture is cooling, beat the egg whites in a large bowl with an electric mixer. Beat the egg whites until they’re firm. Fold in a quarter of the egg whites to the cooled mixture. Add half of the remaining mixture, along with half of the cheddar cheese, and fold it to combine. Fold in the leftover egg whites and cheddar cheese. Put the mixture into the souffle dish. Put the souffle into the oven and reduce the heat to 375 degrees. Let it bake for about 25 minutes. It’s crucial that you do NOT open the oven during the first 20 minutes — this may cause your souffle not to rise properly. When the souffle is done, it should be golden-brown and wiggle slightly when you gently shake the dish. When you incorporate Sauder’s Eggs, your cheese souffle will be even better. Use our store locator today to find our top-quality eggs at your nearest store.